Canonical is replacing its signature brown color scheme with the debut of Ubuntu 10.04, the next major release of the popular Linux distribution. Departing from six years of interface tradition, Canonical has revealed a new "light" default theme and updated Ubuntu logo that introduces a pallet of purple, orange, slate grey, and tan. The new look made its public debut on the blog of Ubuntu Community Manager Jono Bacon on Wednesday. 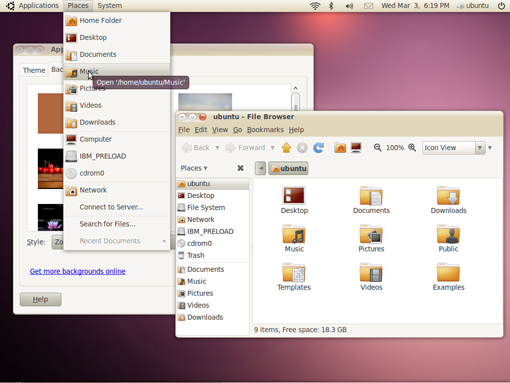 The Ubuntu team said the new visual style is "inspired by the idea of light.'" "We're drawn to Light because it denotes both warmth and clarity, and intrigued by the idea that 'light' is a good value in software," the Ubuntu design documentation waxes poetical. "Good software is 'light' in the sense that it uses your resources efficiently, runs quickly, and can easily be reshaped as needed." (Decently-scaled screens are viewable here). The new theme does its little turn on the catwalk with the release of Ubuntu 10.04 LTS. The update also include a new boot splash screen for Ubuntu — although the devs boast "not that you'll see it for very long thanks to the amazing work by the engineering teams!" 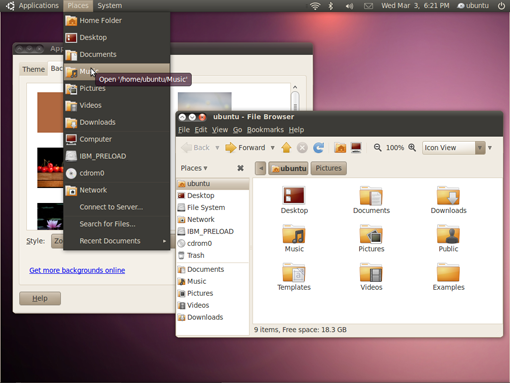 Canonical has discussed a complete overhaul to the default theme since Ubuntu 8.04, Hardy Heron. But Ubuntu happens — and the familiar browns have remained from the very first distribution back in 2004 until now. According to the Ubuntu branding wiki, the new style was first conceived last year by a small team helmed by Mark Shuttleworth who gathered to review the OS's branding and public image. The results of that huddle will now be applied to both the operating system's UI as well as how Ubuntu will present itself to the public. A gallery of how Canonical plans to pitch Ubuntu everything from advertisements, to T-shirts, to CD covers, to coffee mugs can be viewed here.